GC Hitched is hosting the ultimate workshop for engaged couples planning to get married on the Gold Coast! Guests will enjoy a fun and informative evening with exclusive access to a hand-picked panel of local suppliers from a variety of categories that truly reflect the modern + stylish aesthetic of the current wedding scene. Hear from Jason Lucas – Founder of Lucas & Co Photography || Jason has been in the photography industry for over 14 years. The journey of Lucas & Co started back in 2010. Since then, he + his wife Sarah have formed a small and intimate team who are all passionate about candid, natural and honest photography. Their work has been featured on The Lane, Hello May, White Magazine, Style Me Pretty, Wedded Wonderland, Polka Dot Bride, Nouba and in Cosmo Bride Magazine and Harpers Baazar. 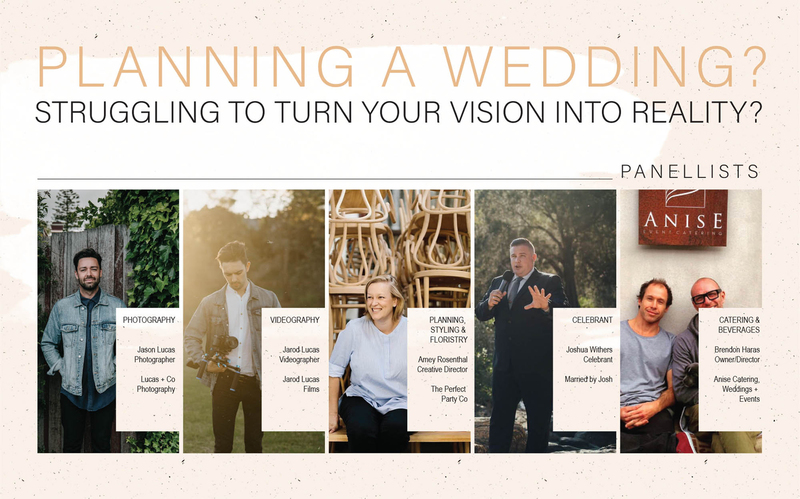 Hear from Jarod Lucas – Founder of Jarod Lucas Films || Taking limited weddings each year, Jarod creates timeless and romantic wedding films to last the decades. Inspired by travel, fashion and cinema, each film has a classic and artistic style, yet personal and unique to each couple. He has shot all over Australia and the world. Hear from Amey Rosenthal – Creative Director of The Perfect Party Co || The Perfect Party Co provide everything from planning, styling and floristry for dinner parties of twelve, to international destination weddings as well as corporate functions of 500+. The Perfect Party Co creates memorable and unique events, crafted with love and attention to detail. Amey is the master of her craft; a consummate professional. She also owns/operates Out of the Dark Event Lighting. Hear from Josh Withers – Married By Josh || Josh is one of a kind. He creates awesome marriage ceremonies and MC’s fun wedding receptions for adventurous humans. He lives on the Gold Coast with his wife and family, but travels the globe creating meaningful, personal, and enjoyable weddings for people just like you. Hear from Brendon Haras – Owner/Director of Anise Catering, Weddings + Events || Anise was formed 5 years ago by two good friends with over 25 years experience in the food + beverage industry. Anise is now one of the most well received and highly respected event caterers in the region. Brendon has cooked in every kind of kitchen and received many accolades along the way. It’s not every day bride + groom’s to-be have an opportunity like this, to be up close + personal with a panel of industry professionals like these. Expect to receive invaluable advice from these game-changers while sipping on some champagne and tasting some culinary delights! We’ll also be conducting a little Q+A at the end, so come armed with any burning questions that you might have. Tickets are limited, so make sure you don’t miss out!